Since I don't want to be the slacker that I have been the last few days, I'm trying to post early. While I haven't been as crafty as in previous weeks, I have been productive this week. (Hoping to get my craft on this evening) Not only did I get the house cleaned, but I've done the grocery shopping (for more than one meal - egad!) I usually run to the store on a fairly daily basis to get the supplies for whatever meal. I have been known to go to the store at least three times in one day. Fortunately, we do have an array of grocery stores fairly close to my house. So, I try to mix it up and shop at a different one each time, before the cashiers start to recognize me. This week, LOML* and I also got to check out the new Bass Pro Shop in our area. It's HUUUUUGE!! They have so many taxidermied animals I started to cry at one point. I don't handle dead animals staring at me too well. We found our favorite sections of the store though. First, on the second floor there's the camping, canoing, kyacking, and bar-b-quing sections all grouped together. Secondly, they have a restaurant in there. LOML* didn't think he would be interested in the restaurant, but I wanted to at least look. It was the last thing we did. 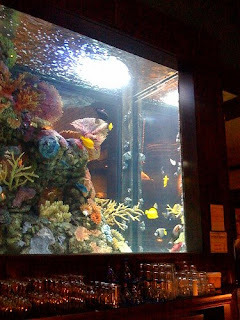 As soon as we saw the 1,300 gallon saltwater tank of tropical fish behind the bar and a Sweetwater beer tap, we were drawn inside for about an hour. The whole time, we mumbled to each other, "I can't believe we're in a Bass Pro Shop." It was a nice evening. I even bought a new water bottle. The water bottle wasn't the cheapest one I've ever purchased, but is perfect for me. That's why I feel like a bit of a hypocrite posting this on "Thifty Thursday." I hope the thrifting gods forgive me. Here are some tips on making individual portions for freezing. If you live for coffee like I do, you may also needs these ideas on some uses for coffee grounds. Lastly, I thought I'd share these home accents for $1 or less. Who can't afford that? Oh, I NEED to share this - The writing of The Hobbit movie has begun!! Take my poll!! You can add your own suggestions too! I just took your poll. Also, sorry about not being able to call at the beginning of the week...lemonade spilled all over my phone on Monday and is not really working...I think it must have water damage...BLEH! Jason said he told you what was going on though. Anyhow, sorry we didn't get to see each other again but I enjoyed the time we did get to spend together and we will def have to do trivia next time!!! Miss you and can't wait to get back down there!!! Gray - I'm so glad you made it home safe and I can't wait to "do trivia" (if that's what you kids are calling it) when you get back in. Let me know how the semester goes. I'll miss you!! Susana- THANKS!! I saw the pics you posted from the trip. Looks like you and MIke had a great time. Bella - I'm so glad you're excited too. And I figured you had already done the poll. THANKS!! !